The Reality Check series makes just one assumption: that you're serious enough about your spiritual journey to investigate Christianity with an open mind. This isn't about joining anyone's religious club-it's about being real with yourself and with the others in your group. Since no one has all the answers, there's plenty of room for discussion. After all, if there is any truth to the Bible's stories about Jesus, then one thing he'd welcome are questions and opinions that come from honest, earnest hearts.Never has one week made such a far-reaching difference. It began with the applause of the masses for their controversial hero. It darkened into betrayal, a kangaroo court, and a brutal execution. And it concluded with an event so stunning that it has shaped history ever since: the resurrection of Jesus from the dead. 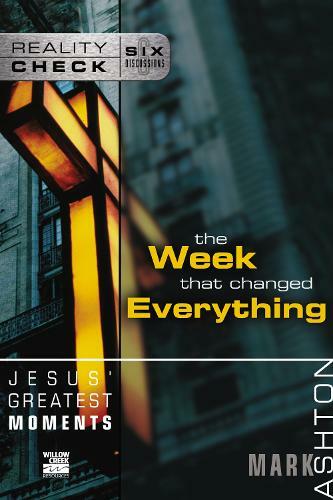 As you relive the dramatic highs and lows of this unparalleled week, you'll discover why Jesus was far more than a great moral teacher-and why, among all other religious leaders, Jesus stands without equal.Jesus' Greatest Moments includes these sessions: The Grand Entrance Betrayed by a Friend Framed!? A Dramatic Crisis The Comeback! A Startling ImpactFor the Group LeaderReality Check is for spiritual seekers of every persuasion. Uncompromisingly Christian in its perspective, it steers wide of pat answers and aims at honesty. This innovative and thought-provoking series will challenge you and those in your group to connect heart to heart as together you explore the interface between Jesus, the Bible, and the realities of this world in which we live.